One day after announcing that guard Khris Middleton would be lost for six months with a torn hamstring, the Milwaukee Bucks made a trade. 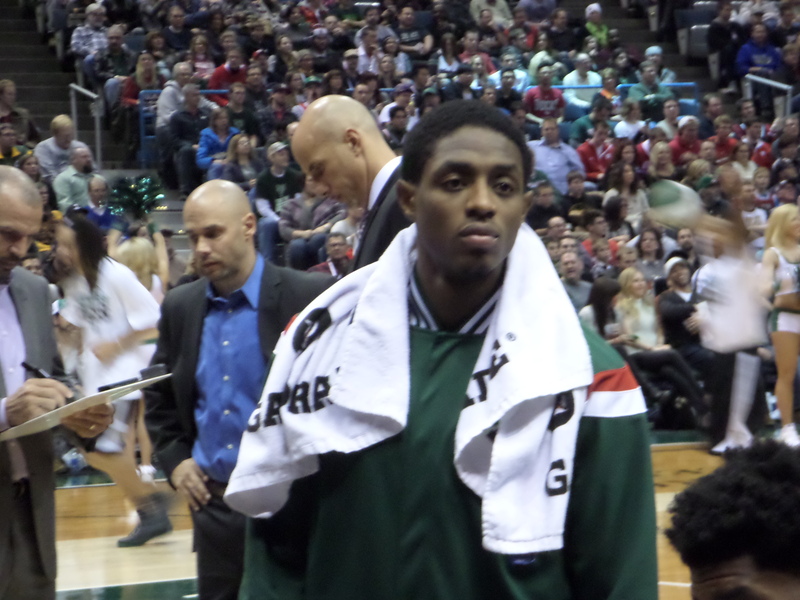 The Bucks sent guard Tyler Ennis to the Houston Rockets in exchange for forward Michael Beasley. The 27-year-old Beasley appeared in 20 games for the Rockets last season and averaged 12.8 points and 4.9 rebounds a game. 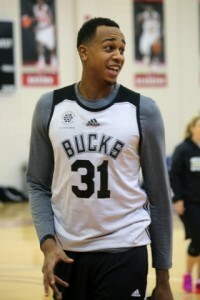 Prior to signing with Houston, Beasley played in China with the Shandong Golden Stars and averaged 31.9 points, 13.4 rebounds and 3.8 assists a game. Beasley was the number-two overall pick by Miami in the 2008 NBA Draft. He has career NBA averages of 13.0 points and 4.8 rebounds in 453 games with Miami, Minnesota, Phoenix and Houston. The 22-year-old Ennis averaged 4.5 points and 2.1 assists in 46 games for the Bucks last season. The Milwaukee Bucks started the fourth quarter trailing the Memphis Grizzlies by five points. They went with their bench and came from behind to pull out a 96-86 victory. Jason Kidd went with John Henson, Miles Plumlee, Rashad Vaughn, Tyler Ennis and Damien Inglis. That group outscored the Grizzlies 28-13 in that fourth quarter and they never left the floor. Ennis led the way with all 13 of his points in the final quarter. The Bucks had eight of their 17 blocked shots in the quarter. Things got a little chippy in the final four minutes. John Henson committed a hard foul on Lance Stephenson that resulted in a flagrant-1 call, as well as a technical for getting in Stephenson’s face after the play. Then with 5.5 seconds left and the Bucks up by 10, Henson came from behind to block a Matt Barnes shot out-of-bounds. Henson then got in Barnes’ face for a short time. Both players received technical fouls and Henson was ejected. Even though Barnes hadn’t been tossed, he took off for the tunnel with some Bucks coaches and staff members in hot pursuit. Nothing ended up happening and the game ended with a Bucks victory. Giannis Antetokounmpo led the Bucks with 15 points, 11 assists and six rebounds. The Milwaukee Bucks were held to 33% shooting from the field and made just 3 of 13 three-point field goals, falling to the San Antonio Spurs 95-70. The 70-point total is a season low for the Bucks. After the Bucks climbed to within 50-44 early in the third quarter, the Spurs went on a 15-to-one run and the Bucks never challenged from there. The Spurs outscored the Bucks 28-17 in the third quarter and it became a game for the reserves in the fourth quarter. Khris Middleton had 16 points to lead the Bucks (7-12). Greg Monroe added 14 points and seven rebounds. Jerryd Bayless didn’t play and second-year guard Tyler Ennis started in his place. The Bucks guards combined to shoot seven for 32 from the field. Tim Duncan had 16 points and ten rebounds for the Spurs (15-4) who have won 19 straight home games. The Bucks haven’t won in San Antonio dating back to 2008. Jabari Parker: Photo Courtesy of the Milwaukee Bucks. The Milwaukee Bucks say forward Jabari Parker and guard Tyler Ennis have both been medically cleared to return to action on Wednesday when the Bucks host the Philadelphia 76ers at the BMO Harris Bradley Center. The news couldn’t have come at a better time. The Bucks have struggled out of the gates. They’re 0-3 for the first time since 1976. In 25-games last season, Parker averaged 12.3 points, 5.5 rebounds and 1.7 assists a game. He earned Eastern Conference Rookie of the Month honors for October/November and was the first teenager in over 30 years to record multiple double-doubles in his first three career games. Parker underwent season-ending knee surgery on Jan. 5 after suffering a left knee ACL injury at Phoenix on Dec. 15. The 21-year-old Ennis averaged 3.7 points. 2.2 assists and 1.1 rebounds in 33 games last season with the Bucks and Suns. He was acquired from Phoenix on Feb. 19 in a three-team trade that also brought Miles Plumlee and Michael Carter-Williams to the Bucks. The Milwaukee Bucks have exercised contract options on four young players on Monday. 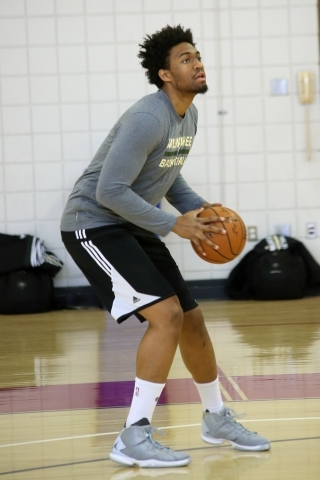 Forward Jabari Parker and guard Tyler Ennis now have third-year rookie deals with the Bucks. General manager John Hammond also picked up fourth-year contract options on forward Giannis Antetokounmpo and guard Michael Carter-Williams. The 24-year-old Carter-Williams averaged 15 points, five rebounds and seven assists in 66 games last season with Philadelphia and Milwaukee. Antetokounmpo averaged 13 points and seven boards in his second year with the Bucks. The 20-year-old Parker missed most of his rookie year with a knee injury. He averaged 12 points and six rebounds in 25 games. Ennis was traded from Phoenix in February, with four points and two assists in limited time off the bench. The Bucks are about to open the regular season on Wednesday night against the New York Knicks at the BMO Harris Bradley Center. The Milwaukee Bucks traded guard Brandon Knight in a 3-team deal just before the NBA’s trade deadline this afternoon. 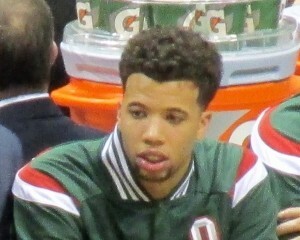 Knight goes to the Phoenix Suns while the Bucks get 6’6 point guard Michael Carter-Williams from Philadelphia and rookie guard Tyler Ennis and center Miles Plumlee from the Phoenix Suns.